CHICAGO — He’s a Super Bowl champion and a Super Bowl MVP, to say nothing of his regular-season MVP award. 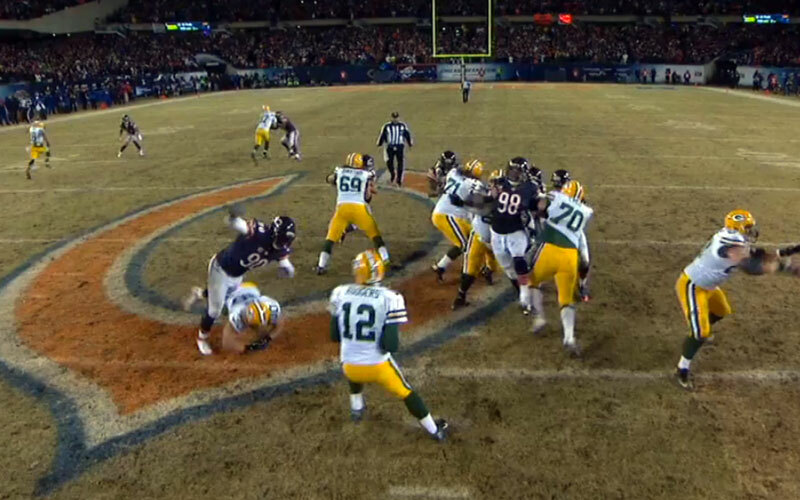 So in the grand scheme of things, Packers quarterback Aaron Rodgers did not need this moment. But when you follow in the footsteps of Brett Favre and call Lambeau Field home, your own little piece of folklore never hurts. 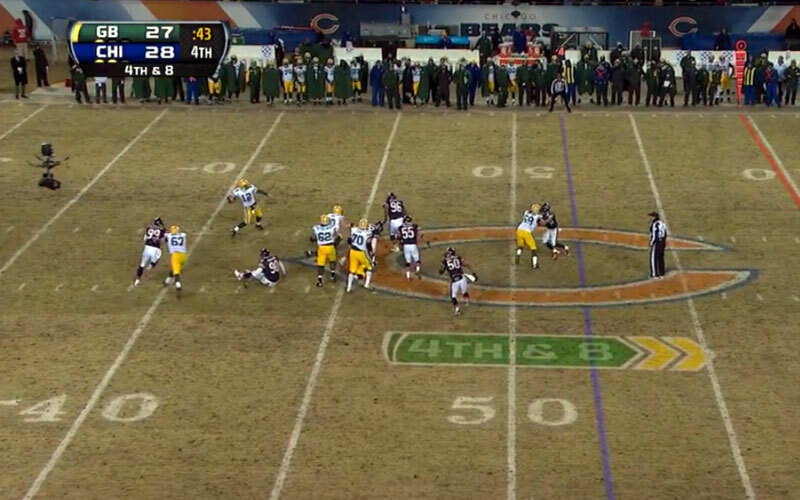 So on a classic winter’s eve on the shores of Lake Michigan, in a freezing rain that turned into snow, Rodgers returned from a left collarbone injury to play in a winner-take-all season finale at Soldier Field. Though his Favre moment came with a lot of help from fullback John Kuhn and a breakdown in the Bears’ secondary, the details hardly mattered: A team that didn’t win a game in November ended up wearing the NFC North crown. Kuhn called the Packers’ final play a “leap of faith.” For the Packers faithful watching the season come down to 4th-and-8 with 46 seconds left to play, Rodgers’ 48-yard touchdown pass to Randall Cobb was a prayer answered. A miracle even: It was Green Bay’s third fourth-down conversion on a 15-play, 87-yard drive that chewed up 5:46 and resulted in an improbable 33-28 victory. The Packers were on the verge of elimination after a demoralizing 40-10 loss to the Lions on Nov. 28 that capped a five-game stretch in which they lost four and tied the lowly Vikings. But they had one final surge, winning three of their last four, including Sunday’s de facto playoff game against their bitter rivals. Rodgers might have entered folklore after returning from a seven-game absence, but the narrative could have been vastly different when coach Mike McCarthy set himself up to be second-guessed for eternity by not going for two with 11:38 left in the game. Eddie Lacy ran for a six-yard touchdown and Mason Crosby tacked on the extra point, pulling Green Bay within one, 28-27. But McCarthy probably figured there were more touchdowns to be had in this back-and-forth affair, which had seen five TDs scored to this point since halftime. Instead, the scoreboard remained frozen like the 62,708 fans watching from the stands. 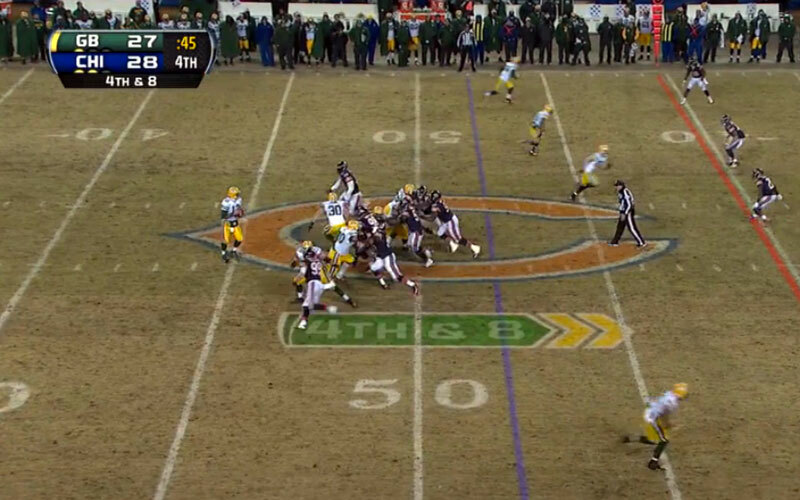 On the Packers’ final drive, McCarthy was gutsier. With 4:41 to play, he went for it on 4th-and-1 from Green Bay’s 22. Kuhn picked up the yard on a plunge. Just after the two-minute warning, on 4th-and-1 from Green Bay’s 44, Jordy Nelson plucked his 10th and final reception nearly off the turf for six yards. But there they were again with 46 ticks remaining, facing another do-or-die fourth down in a do-or-die game. Bears coach Marc Trestman explained the aggressive call against a quarterback who is normally lethal against the blitz. “We can sit back in zone and give him the opportunity to make a play, or we can try to make him rush the throw and we had good pressure on,” Trestman said. The Packers lined up in a 3x1 set with James Jones, Cobb and Nelson to Rodgers’ left, and tight end Andrew Quarless to the right. Instead of having a running back in the backfield as an outlet for Rodgers, the Packers deployed Kuhn for exactly this blitzing situation—only Rodgers has more intimate knowledge of the Packers’ offense and blocking schemes than the eight-year fullback. 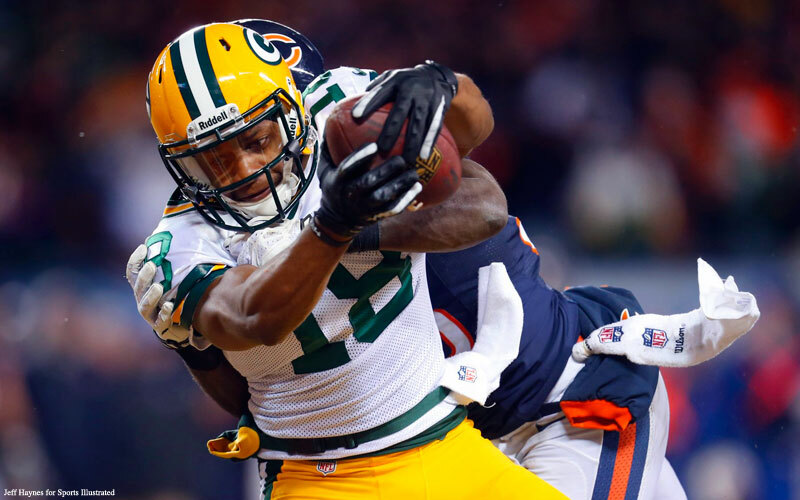 “As usual, the guy making the smart play at the right time,” Rodgers said. The original protection called for left tackle David Bakhtiari to block down to his right, leaving dangerous end Julius Peppers as the free rusher. Kuhn’s check called for Bakhtiari to stay on Peppers and leave nickel back Isaiah Frey for Kuhn to block on the inside. The problem? 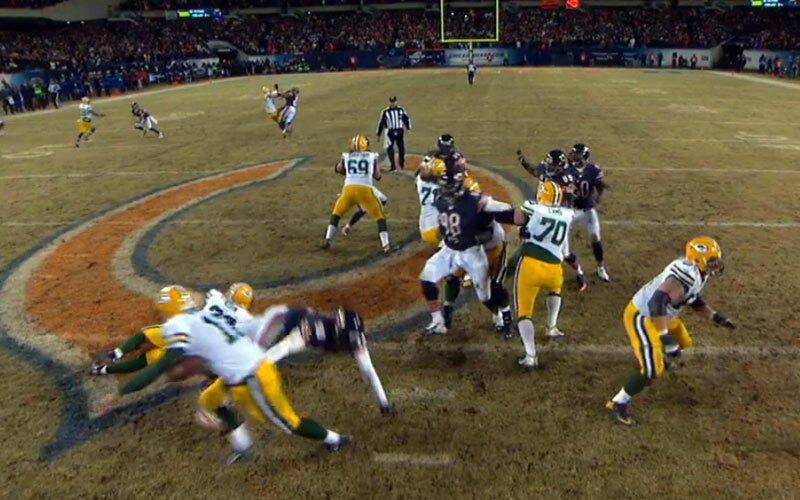 Bakhtiari didn’t hear the call. 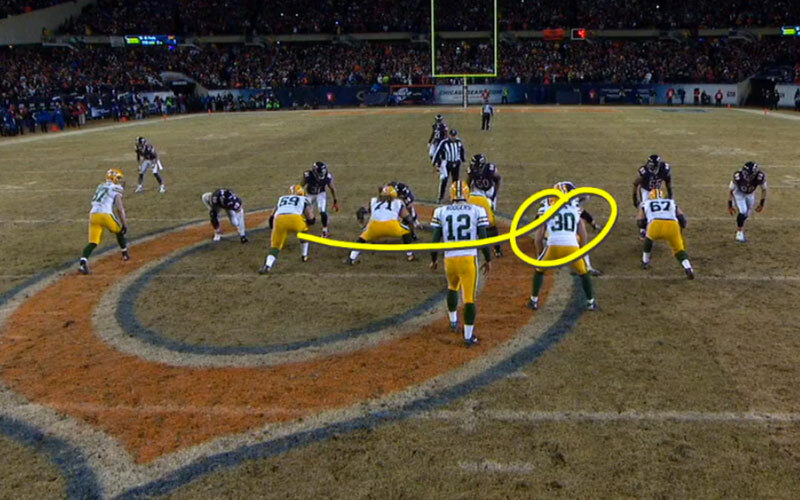 With Rodgers now rolling to his left, it was up to the Bears’ coverage to stop the play. Instead, they had busted coverage. While safety Major Wright did his job playing man-to-man (and illegally knocking Nelson to the turf), safety Chris Conte and cornerback Zackary Bowman were playing zone. 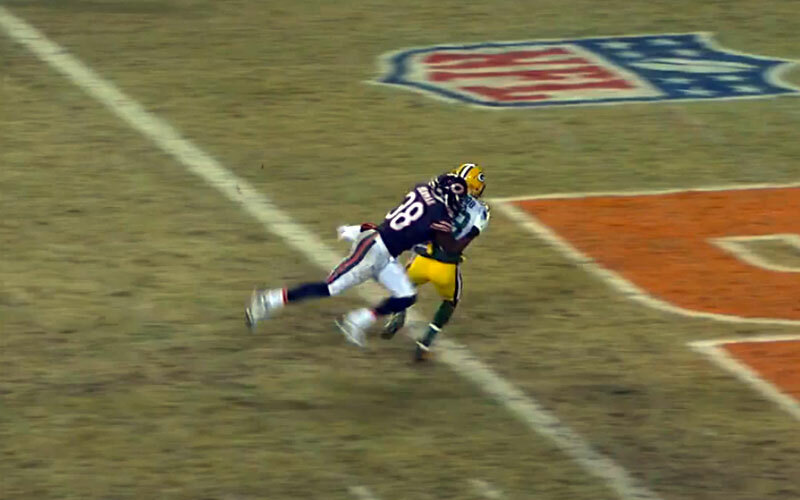 Even after the game, the Bears still didn’t have the call straight. 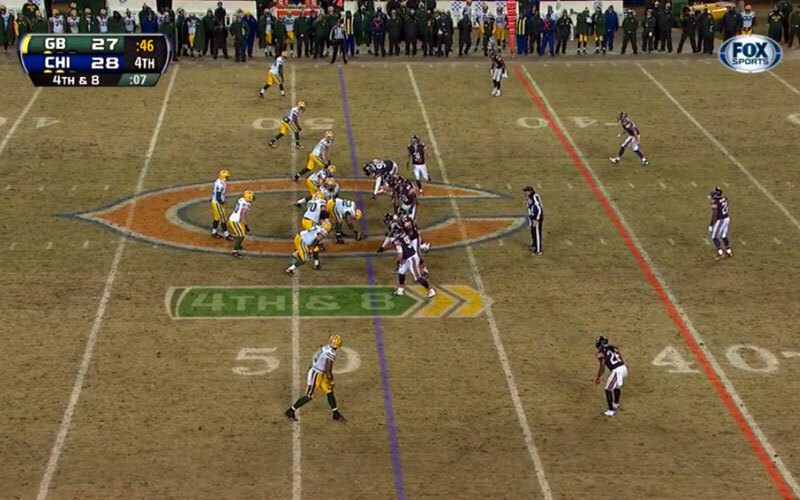 “It’s man coverage,” Trestman said. Cobb instantly recognized that Conte was squatting on his prescribed curl route at the first-down marker. 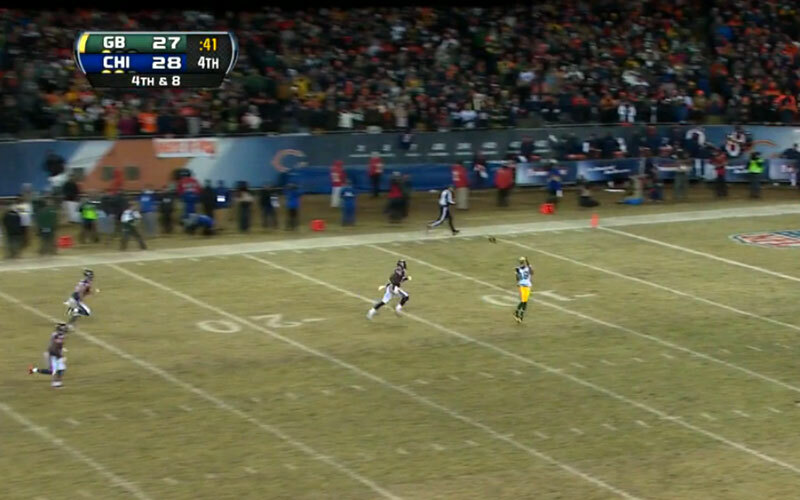 So after six strides, Cobb raised his hand and continued on a go route. “I saw that the safety was flat-footed and stayed on the move,” he said. 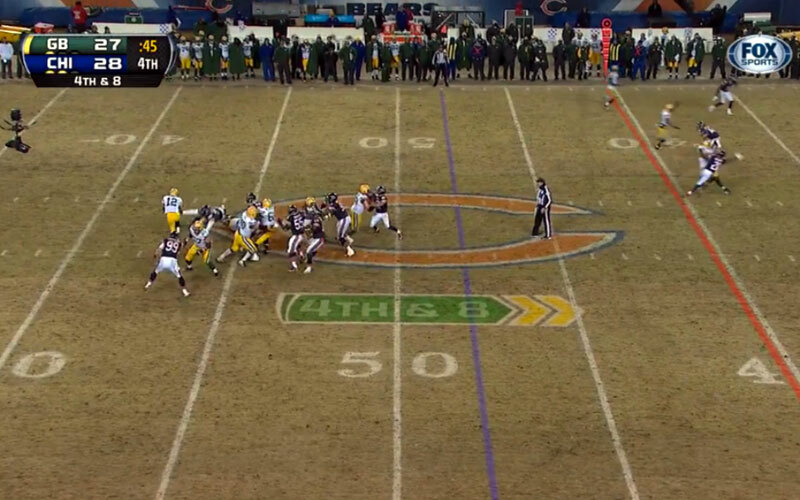 At that point, it was up to Rodgers to elude the long grasp of Peppers, get outside the pocket, turn his shoulders downfield and get the ball to a wide-open Cobb. 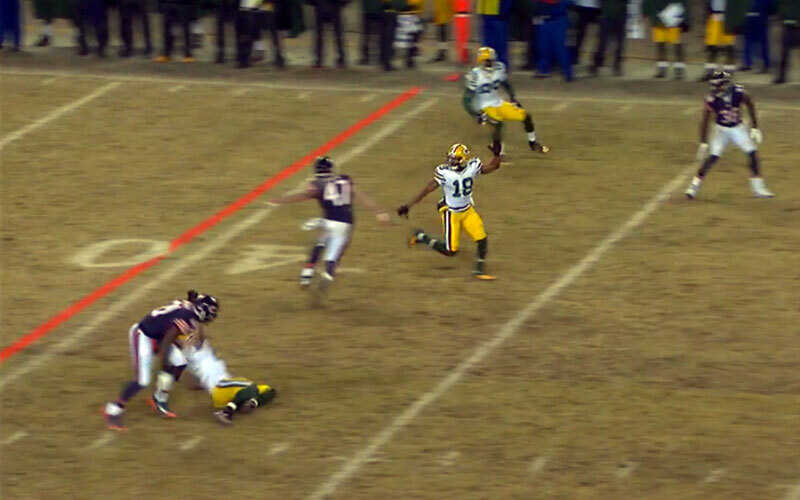 Finally, it was up to Cobb to put the finishing touches on the play. 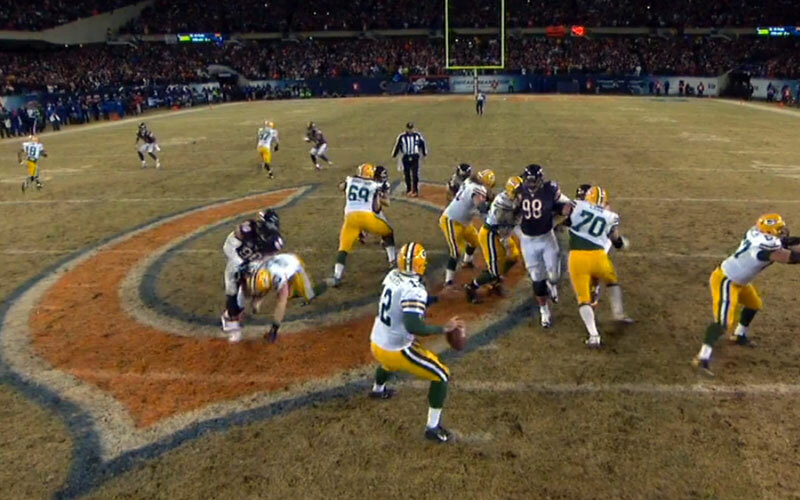 At 7:25 p.m. CT, 2.27 seconds after leaving Rodgers’ hand, the ball finally dropped out of the sky and into Cobb’s arms at the 10-yard line. He took it in the rest of the way, and the left-for-dead Packers had the game-winning touchdown, the NFC North title and a playoff berth—and Rodgers had his own can-you-believe-it? moment.